Kulfi (Indian cardamom spiced ice cream) – no ice cream maker required! I am very happy to have successfully made kulfi, an Indian style ice cream containing cardamom, which must be one of the most beautiful, delectable spices in the world. It definitely makes it in to my *exciting ingredient* list. This kulfi is refreshing, surprisingly easy to make (95% of the work is stirring), you don’t need an ice cream maker and it tastes gorgeous and exotic. I have my sister to thank for my obsession with cardamom – she went to University in Bradford and every visit involved a trip to the Indian sweet shop. 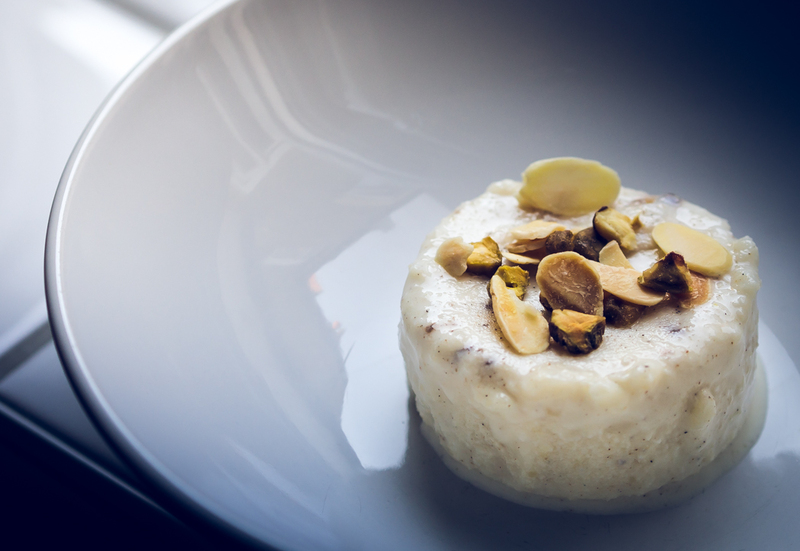 The ice cream contains whole milk, ground almonds, rice flour, sugar and cardamom and is cleverly topped with flaked almonds and chopped pistachios to give it a little crunch. Allow about 1 hour 30 mins to make it (as I say most of this is stirring and cooling) and then at least 5-6 hours for it to freeze. It serves 4-6 people depending on what container you use – I recycled glass ramekins but you could use any small freezable container. You can get rice flour from most supermarkets now (sometimes in the gluten free section) and ground cardamom from Indian shops. If you can’t find ground cardamom you could buy cardamom pods from the supermarket and crush them. My kulfi was a little lumpy in parts when I put it in the ramekins but it still worked! The recipe is from the inspiring book Indian Food Made Easy by Anjum Anand. It is a great book if you want to try out Indian cooking for the first time and then feel pleased with yourself! For two equally manageable and delicious recipes from the book check out these previous posts: https://katielovescooking.wordpress.com/2012/12/07/paneer-tikka-masala-authentic-curry-in-50-mins/ and https://katielovescooking.wordpress.com/2013/01/29/stupendous-halloumi-and-veg-tandoori-kebabs-with-quinoa-pilaf/. Heat the milk in a saucepan over a low heat and bring to the boil. Then lower the heat and cook gently, stirring often. Place the ground almonds and flour in a small cup and once the milk is warm, stir in a little milk, make a thin paste and stir back in to the pan with a little sugar. Continue to cook gently as the milk needs to reduce by half – this takes about one hour. If a skin forms on the surface just stir it back in. Stir in the cardamom powder to taste. Cool completely, then decant in to your freezable containers (you will need 4-6 depending on the size). Freeze for at least 5-6 hours and take the containers out of the freezer 20 mins before serving. Dip them for a while in hot water to loosen them (and you may need to use a knife to cut around the edge) then turn on to serving plates. Sprinkle with the nuts!